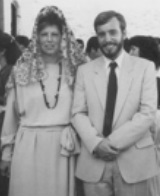 One of my most prized memories is the day my wife and I (pictured above in the village square of Macharaviaya) were matron of honor and best man at the wedding of close friends in the village church. The high walls of the 300 year-old church were still hung with huge, precious oil paintings that had been slashed and torn during the Spanish Civil War, almost 50 years before. What an experience! We felt privileged to be a part of such an important occasion. Our experience in that part of the world was life-changing and stays with us to this day. But, to start at the beginning, I was born in the Pacific Northwest, in southwestern Washington State. We moved around a lot when I was young. My father had migrated from the Oklahoma dust bowl to California in the 1930s, and migration never seemed to leave his blood. Adjusting to new schools, sometimes a few a year, was hard. Reading got me through and became a passion. I gobbled up The Yearling by Marjorie Kinnan Rawlings, The Enormous Egg by Oliver Butterworth, The Black Stallion series by Walter Farley, and many others. My love of stories soon became a zeal for "getting things down on paper." I was writing stories by age six, and at age 11 started my first novel, The Canadian Calf. I had just finished reading The Yearling, so I figured a novel about a young boy in Canada who adopts an abandoned moose calf would be just the ticket. When my younger brother, Doug, got his smelting pole hung up on an old piling and fell into the frigid, fast-moving floodwaters of the Cowlitz River, I came up with the idea for my second novel, The Swift Stream, which concerned the art of smelt dipping in the Cowlitz using a woman's nylon stocking as a net. I knew from then on that my life's goal was to publish fiction. Through adolescence, college, marriage, and children, I never lost sight of it. Sometimes life can throw curves and wavy lines at us, and I've seen my share, but I've never strayed from writing for long. In fact, armed with visions of authoring the great American novel as an expatriate, in 1981, I moved my family to a small village in the hills of southern Spain and it was there that I was able to be a full-time writer for the first time; it was a great gift. We planned to spend one year and stayed for nearly four. I learned the craft of writing; my wife conquered the language and made fast friends. My daughter was the first foreigner ever picked to be queen of the annual village fair, and my son was soon indistinguishable from the other young boys in the village. Alas, wonderful adventures must end, and we returned to the United States and to a more conventional life of work and raising children. I have never stopped writing, but I have only been able very recently to duplicate that special life of the full-time writer and I am currently doing just that, this time in Ecuador, at 8,000 beautiful feet up in the Andes. It is spectacular. My novels are about how families work through grief and loss, which can occur in many forms. Besides grieving loved ones who have died, one can also grieve a divorce, friends from an old neighborhood after moving away, a favorite pet who has died or gotten lost, the loss of status in the community, even the loss of one's place in the world in general. My belief that people can get through these transitions and find a better way of life is what informs and inspires my writing. It is the primary issue in my novel,The Rhyming Season, and again in Cameron and the Girls. My personal motto, which is shared throughout this site, is There Is Room For Hope In Every Heart. That motto keeps me writing.